from ADORA DEVA, handmade with Love. Inspiring Beauty! The beauty of reflected light... light on the ear! Adora as a girl's name is of Greek, Old German and Latin origin, and the meaning of Adora is "a gift," "beloved," "adored." Deva in the New Age movement refers to the Spiritual Forces or Elemental Beings of energy and vibration that make up nature. According to Theosophists, Devas represent a separate evolution to that of humanity. The concept of Devas as nature-spirits derives from the writings of Theosophist, Geoffrey Hodson. It is believed that there are numerous different types of Devas with a countless population supporting Earth's ecological alignment with their resonant Energies. In addition, Theosophists believe that there are Devas living inside the Sun, which make up the indwelling Solar Deity called the Solar Logos. These Devas are called Solar Angels, or sometimes Solar Devas or Solar Spirits. It is believed they visit Earth and can be observed like other Devas by some humans, whose third eyes have been activated. Theosophists believe that there are also Devas living inside all the other stars besides Sol, they are refered to as Stellar Angels. In the Findhorn material, the term Deva refers to archetypal spiritual intelligences behind species, in other words the "group soul" of a species. Some New Age sources use Deva as a generic term to designate any light body being composed of etheric matter... elementals, nature spirits including the fairies, ondines and sylphs. Hodson, Geoffrey, Kingdom of the Gods, 1952, ISBN 0-7661-8134-0 contains color pictures of what Devas supposedly look like when observed by the third eye. Their appearance is reputedly like colored flames about the size of a human being. His paintings represent of some of the Devas seen by Hodson. Deva as a girl's name is of Hindi origin, and the meaning of Deva is "divine, god-like." In Hindu mythology Deva is another name for the Moon Goddess. 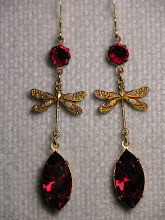 "When I wear Linda’s dazzling Swarovski earrings something mysterious happens. Maybe it’s related to her innate sense of beauty and design. It could be the power of vintage crystals. Whatever the cause, these luscious jewels enhance my sensuality. I feel sexier, more female!!! I feel more beautiful!!! Their beauty literally taps into my beauty and brings it out." The gorgeous earrings you and Amrita Joy picked out for her to gift me are the color of my eyes! Their lovely silver presentation accents my white hair beautifully. Gratitude for your creative mastery. A Sparkling and Blissful New Year to you! Season's Greetings from Adora Deva! Magic abounds in "the Land of Sparkle" with stunning treasures from Adora Deva's Jewel Box! ... If you see something you would like to purchase or inspire your own custom creation ... email me at goodheart88@aol.com... I will follow up with you! I so love creating these TREASURES! 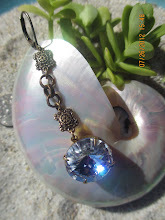 ...because I love inspiring "feel good beauty"
Adora Deva Jewelry enhancing the 5 Elements! "Specially Designed with You in Mind"
Our Light is now highest and brightest in the sky making abundant diamond Light dancing on moving Waters ... and Light Rainbows on the Morning Dew! Relecting the Light in All of Her Majesty! ADORA DEVA draws in her inspiring designs from Light expressing in Beauty and from the Love of GAIA! The Light Sparkles and radiates an aliveness that energizes the senses and uplifts the mood! Sparkling by Day and Twinkling by Night reflecting Light and Love from the Heart of the GODDESS! SPARKLING WISHES FROM ADORA DEVA TO YOU AND YOURS FOR A DE'LIGHT FILLED SUMMER! Carole, the owner of the "ROSE and THORN" is the magic behind this beautiful gift shop and gardens. ROSE and THORN now carries a large selection of ADORA DEVA'S magical, sparkling Swarovski Crystal Earring Treasures and it's likely that you may find a full on "ADORA DEVA TRUNK SHOW" happening on a sunny Saturday or Sunday afternoon, out in the beautiful gardens here. Everyone who visits is treated like family. Carole has created a "happy place and serene haven" filled with plants and flowers, beautiful gardens with free roaming chickens and so many beautiful and unique garden treasures, whimsical gifts, and of course our SPARKLING ADORA DEVA CRYSTAL EARRINGS and MORE! "The Rose and Thorn is like Disneyland in Sonoma County. It's a happy energy which is magical and enchanting." "It's like there is fairy dust everywhere." Discover this Gem on the map at "Rose and Thorn"
offers a wonderful selection of ADORA DEVA'S sparkling earring treasures! ADORA DEVA' S SPARKLING TREASURES at Gerrie's & Peter's P & G Art GALLERY! ADORA DEVA'S JEWELBOX is filled with hundreds of exquisite, one-of-a-kind, hand set Swarovski Crystal earrings, necklaces & bracelets. Dazzle yourself & gift the loves in your life with a rare treasure from ADORA DEVA ! What I love so much about wearing your beautiful creations is that I feel the love and power of them...... they are so much more than beautiful sparkling adornments..... I feel like I'm putting on a magnetic charm that is supporting my manifesting process to attract all that is LIGHT and GOOD into my life in profound abundance.......... Not to mention that I'm fully in love with the Energy Being that's creating them!!! YOU!!! What I like about wearing your jewelry is that I know there is much more invested in the making of each piece than just the beautiful craftsmanship. I know you instill intention with each piece that it will find its rightful home and that it will bring its owner happiness and peace. I believe that the crystals hold the energy of your intention. When I wear your jewelry I feel much more in sync with life. I love your creations as much for their beauty as for what is behind them. People stop me to comment on my earrings wherever I go: in the bank, the library, the grocery store, and on the street! I am always happy to share with them Adora Deva's information, because I want to spread the MAGIC!!! Wearing these unique creations I feel enhanced. 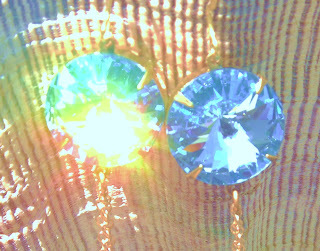 They allow me to reflect light and sparkles wherever I go... it's a joyous feeling! Wearing these beautiful creations is a threefold pleasure: First, feasting my eyes on them before putting them on, Second, feeling them make me more attractive, Third, receiving the compliments that always come. 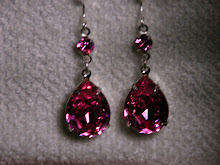 When I wear Linda’s dazzling Swarovski earrings something mysterious happens. Maybe it’s related to her innate sense of beauty and design. It could be the power of vintage crystals. 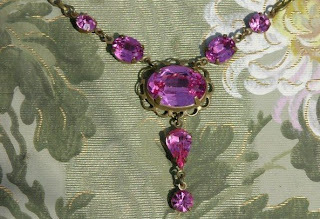 Whatever the cause, these luscious jewels enhance my sensuality. I feel sexier, more female!!! I feel more beautiful!!! Their beauty literally taps into my beauty and brings it out. 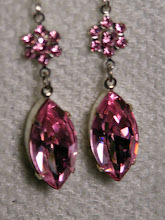 I love my Adora Deva earrings. They're unique and very easy on the ear. Every time that I wear them, strangers stop me to say how beautiful they are. 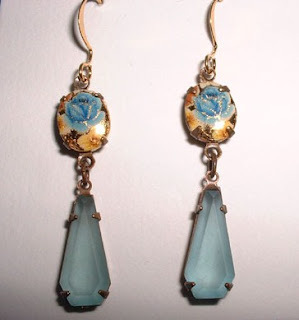 "Everytime I wear a pair of Adora Deva earrings, the compliments come pouring in. People remark upon the care that has clearly gone into selecting each element-- though the sparkling vintage jewels take center stage, even the hooks are noticed for their graceful curves. With Adora Deva jewelry, finally beauty doesn't hurt! 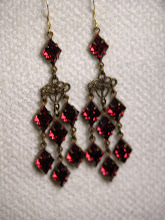 I am able to enjoy wearing these earrings because even the more elaborate styles are light-weight and comfortable. Also, the muted tones of the metalwork enable me to pair Adora Deva jewels with other pieces in either the gold or silver family. More care, more comfort, more choices, more compliments!" I receive the earrings today! They are wonderful and mystical!... already wearing them even though I'm just at home. Thank you so much! I will spread the word! I love your earrings. I have 3 pair now. You were so kind to replace the one that I had lost. An amethyst dragonfly. I wear them often and get great joy from them. Bless you and I hope your business prospers. Your jewelry is gorgeous. GORGEOUS ANKLET & BRACELET ADORNMENTS. DELICIOUS ARRAY OF COLORS, SHAPES & STYLES! AFFORDABLE TREASURES TO POSSESS & FOR GIFTING. FOR DRESSING UP & STEPPING OUT. FOR THE JOY OF ANY DAY SPARKLE! PAGEANT, BALLROOM, CABARET, BELLY DANCER & PERFORMANCE ARTIST! I PROMISE, YOU WILL SPARKLE IN RED CARPET STYLE! "A BRILLIANT IDEA" THE SWAROVSKI FAMILY "CRYSTAL LEGACY"
IT BEGAN IN THE 19TH CENTURY IN THE AUSTRO-HUNGARIAN EMPIRE. DANIEL SWAROVSKI WAS BORN ON OCTOBER 24, 1862 IN GEORGENTHAL, BOHEMIA. AT THAT TIME BOHEMIA WAS THE TOP PRODUCTION CENTER IN THE WORLD FOR GLASS AND CRYSTAL PRODUCTS. DANIEL'S FATHER OPERATED A CRYSTAL FACTORY. HE WAS HIGHLY ESTEEMED FOR HIS FINE SKILL IN THE ART OF MANUALLY CUTTING CRYSTAL. IT WAS THERE, AS A YOUNG BOY, DANIEL LEARNED HIS PASSION FOR THE ENTIRE PROCESS OF MAKING GLASS INTO CRYSTAL OBJECTS OF BEAUTY AND BY AGE 21 HE COMPLETED HIS HIGHLY SKILLED, TRADE APPRENTICESHIP. IN 1883 DANIEL ATTENDED THE FIRST INTERNATIONAL ELECTRICAL EXHIBITION, "ELEKTRISCHE AUSSTELLUNG" IN VIENNA, AUSTRIA WHERE HE MET THOMAS EDISON, CONSIDERED TO BE ONE OF THE MOST BRILLIANT INVENTORS OF THE WORLD. TRULY INSPIRED, DANIEL HAD A BRILLIANT IDEA: BUILD A MACHINE FOR THE PRECISE CUTTING OF CRYSTAL! DETERMINED TO REALIZE HIS VISION, HE WORKED ON HIS DESIGN FOR 9 YEARS. IN 1892, DANIEL REGISTERED A PATENT ON THE MACHINE HE EXCLUSIVELY INVENTED, WHICH MADE IT POSSIBLE FOR THE FIRST TIME, TO CUT CRYSTAL TO PERFECTION. DANIEL'S INVENTION WAS REVOLUTIONARY! IT FOSTERED A NEW AGE IN THE WORLD OF MANUFACTURING & CUTTING GEMS & CRYSTAL PRODUCTS. THE SWAROVSKI COMPANY WAS ESTABLISHED BY DANIEL SWAROVSKI, HIS BROTHER-IN-LAW, FRANZ WEIS AND A GOOD FRIEND, ARMOND KOSMANN. ON OCTOBER 1, 1895, DANIEL & HIS PARTNERS FOUND THE IDEAL LOCATION IN THE AUSTRIAN ALPS, IN WATTENS. THERE THEY BUILT THE FACTORY & LAUNCHED THEIR VISION. THE ABUNDANT WATER RESOURCES IN THIS AREA MADE IT A PERFECT LOCATION FOR HYDRO-ELECTRIC POWER & IT WAS IDEALLY LOCATED NEAR EXCELLENT TRADE ROUTES TO EUROPEAN FASHION CENTERS, LIKE ITALY & PARIS, WHERE THE DEMAND FOR SWAROVSKI CRYSTAL JEWELRY STONES WAS SUPREME. CONSTRUCTION IN WATTENS PROCEEDED AND BY 1907 THE HYDRO-ELECTRIC POWER PLANT WAS FULLY OPERATIONAL, PRODUCING AN ABUNDANT SOURCE OF CLEAN ENERGY. DANIEL'S SONS, WILHELM, FREDRICH & ALFRED HAD JOINED THE COMPANY. IN 1908 THEY BEGAN EXPERIMENTING WITH CRYSTAL PRODUCTION AND BUILT THEIR OWN MELTING OVENS, DISCOVERING & PERFECTING THE "RECIPE" FOR CREATING OPTICALLY FLAWLESS GLASS CRYSTAL. THE IMPACT OF WWI CREATED A SHORTAGE OF MACHINE PARTS AND RAW MATERIALS, SO DANIEL CREATED HIS OWN LINE OF GRINDING WHEELS AND DRESSING TOOLS USED IN THE MECHANICS OF CUTTING CRYSTAL. IN 1917 SWAROVSKI OFFERED THESE TOOLS TO THE OPEN MARKET UNDER THE REGISTERED TRADEMARK, "TYROLIT." 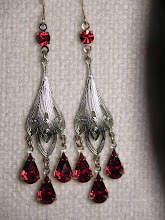 THE PRODUCTION OF FLAWLESS, BRILLIANTLY CUT, SWAROVSKI CRYSTAL JEWELRY STONES WERE SO SUCCESSFUL, THEY WERE COVETED EVERYWHERE BY FASHION HOUSES, JEWELRY DESIGNERS AND MANUFACTURERS OF FINE AND HIGH END COSTUME JEWELRY WORLDWIDE. REFLECTIVE ROAD MARKERS & ROAD SIGNS UNDER THE SWAREFLEX TRADEMARK. IN JEWELRY, ON ACCESSORIES & TRIMMINGS, JEWELRY CRYSTALS INCORPORATED IN DECORATIVE LACES, BANDS & APPLIQUES FOR CLOTHING & FOOTWEAR, CRYSTAL CHANDELIERS (STRASS TRADEMARK), STATE OF THE ART SWAROVSKI TELESCOPES & BINOCULAR LENSES & OTHER OPTICAL PRODUCTS (SWARFLEX TRADEMARK), NUMEROUS LINES OF CRYSTAL ORNAMENTS, FIGURINES & OBJECTS OF BEAUTY, THE CRYSTALS ON DOROTHY'S SLIPPERS FROM THE WIZARD OF OZ, THE CRYSTAL DIAMOND ENCRUSTED GOWN WORN BY MARILYN MONROE WHEN SHE SANG "HAPPY BIRTHDAY" TO PRESIDENT KENNEDY & SO MANY OTHER MEMORABLE MOMENTS ARE ALL A PART OF THE SWAROVSKI FAMILY LEGACY & A MAGNIFICENT LEGACY INDEED. VISIONARY, INVENTOR AND FOUNDER, DANIEL SWAROVSKI LIVED WELL TO THE AGE OF 94. HE FULLY REALIZED HIS LIFE LONG DREAMS! TODAY, "THE SWAROVSKI COMPANY" HAS REMAINED A PRIVATELY OWNED FAMILY FIRM FOR OVER 113 YEARS. IT IS AN INTERNATIONAL ENTITY WITH NUMEROUS SUBSIDIARIES WORLDWIDE. REMARKABLY, THE SWAROVSKI COMPANY HAS BEEN IN BUSINESS FOR OVER A CENTURY. A "GREEN BUSINESS" FROM ITS VISIONARY INCEPTION, THRIVING AND ILLUMINATING BEAUTY IN OUR WORLD TODAY. NECKLACES & GORGEOUS BRACELET ADORNMENTS. AFFORDABLE TREASURES TO OWN AND GIFT SOMEONE SPECIAL. PAGEANT WARDROBE, BELLY DANCER, BALLROOM DANCER & PERFORMANCE ARTIST!